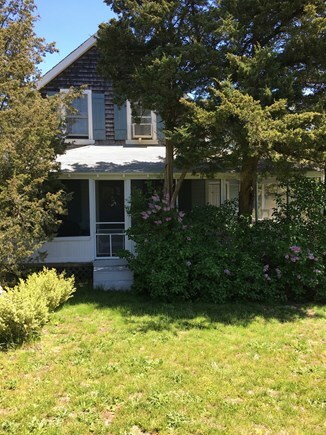 This charming 1920's seaside cottage is less than a 1/10th mile leisurely stroll down a winding path through the dunes to beautiful Skaket Beach. Kids love exploring the tidal pools filled with hermit crabs and other interesting creatures. 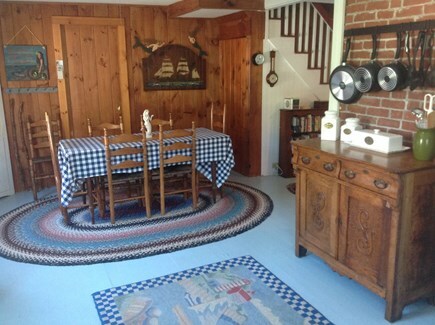 Our cottage is pure old Cape Cod with just enough modern amenities - WiFi, Cable, new flat screen TV, gas grill, washer/dryer, newly installed ductless AC/heat pump on the 1st floor, and a room air conditioner, ceiling and window fans on the 2nd floor. Situated on a lovely half acre, and surrounded by beautiful trees and plantings, the house affords a cozy oasis for your family. There is a picnic table for outdoor dining, a swing set for the kids and a private outdoor shower. 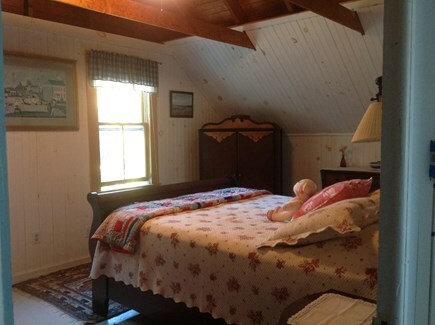 The cottage has 3 bedrooms, all on the second floor. The master bedroom has a Queen size mahogany sleigh bed along with a new half bath, the 2nd bedroom has a full size bed, and the 3rd bedroom has 2 twin beds. The first floor consists of a full bathroom with a stall shower and newly tiled natural stone floor, a full kitchen with separate dining area, and a comfortable living room with TV and fireplace. 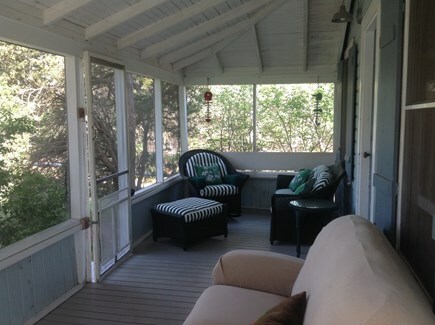 After a wonderful day at the beach kick back on the FABULOUS WRAPAROUND PORCH and enjoy a good book or take a snooze on the porch hammock. There is a small storage shed on the property which contains all kinds of beach equipment including a beach umbrella, several varieties of beach chairs, numerous beach toys, a cooler, and two beach carts which can be used to haul your stuff to Skaket. 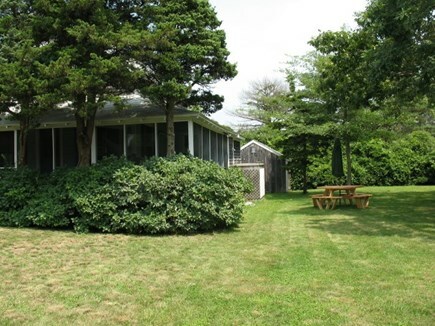 The cottage is a half mile from the renowned Cape Cod Rail Trail- ideal for bicycle enthusiasts, and near all the fine restaurants and shops in town, including the Orleans Farmers Market. 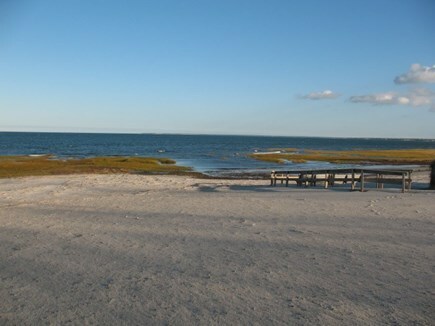 The Cape Cod National Seashore is a 10 minute drive from the cottage. Additional pricing info: $300 refundable security deposit, $65 reservation fee, cleaning fee is included in the rental, State and local taxes of 12.45% will apply. Coming back this year for my 4th stay! We have been renting our cottage on Skaket beach for the last 5 years. 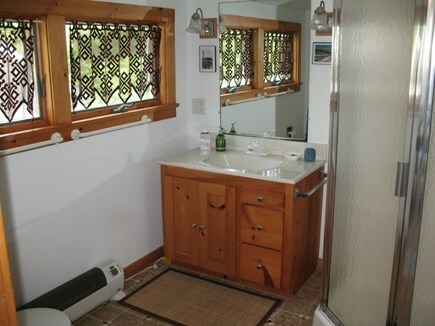 We live locally on a small farm in Brewster and take pride in assuring that the cottage is fully stocked and that our guests have everything they need for a relaxing and carefree vacation. We take pride in adding those personal touches that make you feel you're in your home away from home, not just a rental cottage. 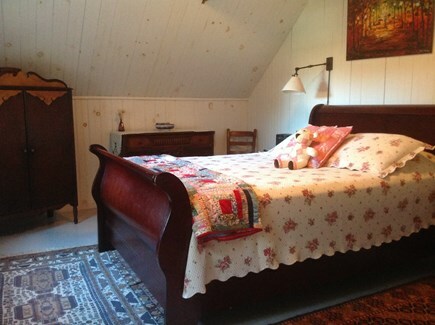 Built in 1927, our cottage maintains its old world charm, which we have artfully blended with modern conveniences. 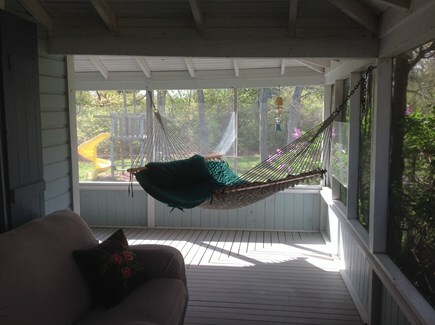 Our guests particularly enjoy the solitude and privacy of the large screened in porch - or maybe just napping on the hammock. Set back a good distance from the road, and surrounded by lush plantings the property is both quiet and surprisingly secluded. Kids can romp around the grounds and enjoy the swing set while parents lounge nearby. An inviting, enclosed outdoor shower awaits your return from the beach. Speaking of the beach, there is no need to pay the $20 daily parking fee. Just load up one of our beach carts and take the pebbled path down through the dunes to the less crowded portion of the beach. 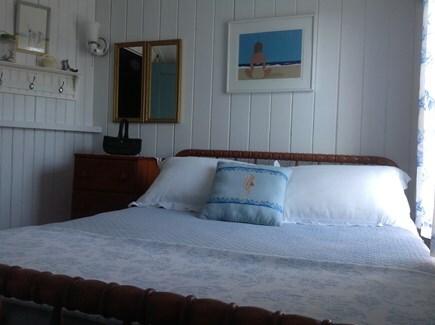 Orleans is a quaint but vibrant seaside town situated between bay and ocean beaches. It offers both family and fine dining, and the Cape's most popular coffee and homemade sweets shop - The Hot Chocolate Sparrow. There is an old time candlepin bowling alley in town - fun for the whole family. The Orleans farmers market, open every Saturday, is the largest on the Cape. There are no big box stores, but plenty of small and unique shops and boutiques. The Cape Cod Rail Trail - a bike and walking trail which now runs from Yarmouth to Wellfleet attracts biking enthusiasts from far and wide. You can bring your own bikes or rent from one of the local bicycle shops. The National Seashore in Eastham is but a 10 minute ride from the cottage. If you enjoy either people watching or whale watching, Provincetown is a mere 25 miles away.